A fatal plane crash in Italy in 1980 was caused by a missile, and the State must pay damages to the families of all 81 victims for not guaranteeing the safety of the skies, Italy’s supreme Court of Cassation ruled in civil proceedings. On June 27, 1980 an Itavia Douglas DC-9-15 jetliner was en route from Bologna to Palermo, Italy when it crashed into the Tyrrhenian Sea off Ustica. All 81 passengers and crew were killed. The airplane was flying at an altitude of FL240 when a rupture in the fuselage caused the plane to break up. Most of the wreckage sank to a depth of some 3500 metres. The cause of the accident has never been officially established. In the years following the accident many theories were suggested. 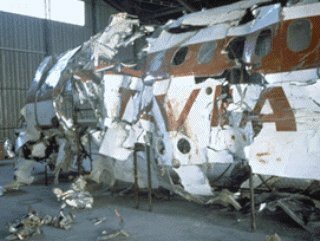 Some theories centered around the fact that the DC-9 may have accidently been shot down by NATO fighters. Either during an exercise involving Italian, U.S., and French jet fighters, or during a dog fight involving Libyan, U.S., French and Italian Air Force fighters in the area. It has also been suggested that explosive device detonated in the rear (starboard) toilet. The supreme Court of Cassation upheld a Palermo appeals ruling that Italian radar systems didn’t adequately protect the skies and that there was “abundantly” clear evidence that a stray missile caused the crash. An investigation by an international Technical Commission, under the Tribunale di Roma, was established in September 1990. The Commission concluded that “the accident was brought about by in-flight break-up resulting from extensive structural damage caused by the detonation of an explosive charge in the rear (starboard) toilet.” No evidence was found in the wreckage of a missile penetrating the aircraft, nor any evidence was found which suggested an explosion of a missile near the aircraft.